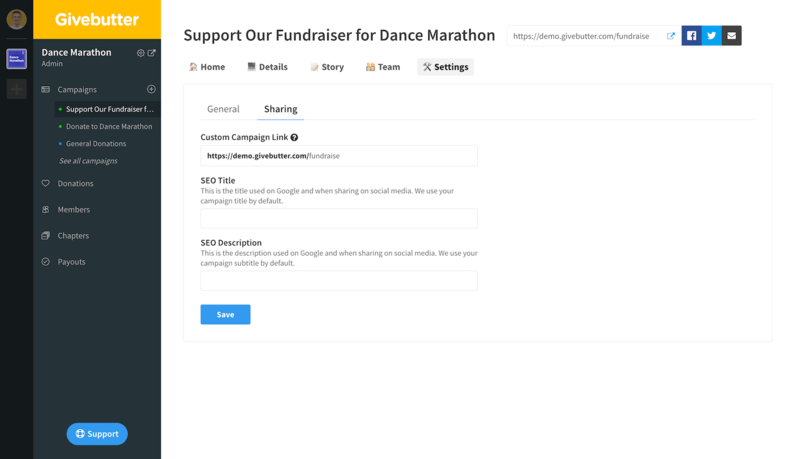 How can I customize my campaign link (URL)? Go to your campaign in the dashboard and click "Settings" > "Sharing" in the Campaign Manager. From there, you can edit the campaign URL ("Custom Campaign Link"). Hit Save when you're done! Please note: changing a URL will break any previous links, including team member invite links. If you have already shared or posted a link to your campaign, please make sure to update the posts with the new links. This post is about changing a campaign's URL. To learn how to edit your group's URL, go here.